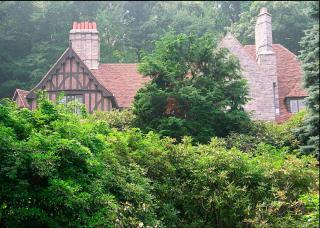 This historic English manor-style house, built in 1928, is listed on New Jersey's Register of Historic Places since September 1986. This magnificent stone residence is a splendid copy of the traditional English Manor House. Beautiful materials have been used throughout and the variety of stone and decorative brick halftimber paneling make it one of the finest examples of the style in Montclair. Mexico. The residence later became the home of Elmer Holmes Bobst, who lived in Montclair for many years and had his initials inscribed above the main entrance porch. A picture of “Highwall” appears in Bobst’s autobiography.